Recently in Astrophysical Journal Letters a paper was published on the oldest “solar twin” yet discovered. The star, HIP 102152, is about 250 light years away from us, and about 4 billion years older than our Sun. When you think of a twin, you probably think of two people who are siblings. For stars, that might be two stars that originated from the same stellar nursery. For this reason, the term solar twin is a bit misleading. In astronomy, a solar twin is a star that appears physically similar to the Sun, regardless of whether they share a common solar origin. In this case, since HIP 102152 is 4 billion years older than the Sun, they couldn’t possibly have formed from the same stellar nursery. Perhaps a better term would be solar doppelganger. HIP 102152 is physically similar to the Sun in two ways. 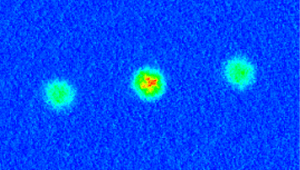 The first is that its mass is almost identical (about 97% the mass of the Sun). The second is that its metal abundances are similar to those of our Sun. When astronomers speak of “metal,” they mean element other than hydrogen and helium. The reason stems from the fact that most of the universe is made of these first two elements, and all the other elements are much, much less common. Through careful observations of the line spectra of the star, the team made precise determinations of the abundances of twenty of the more common elements. They found that with a few exceptions the abundances were within about 5% of the Sun’s values. This means HIP 102152 is chemically very similar to the Sun. With a similar mass and chemical makeup, one would expect HIP 102152 to evolve in a similar way to the Sun. 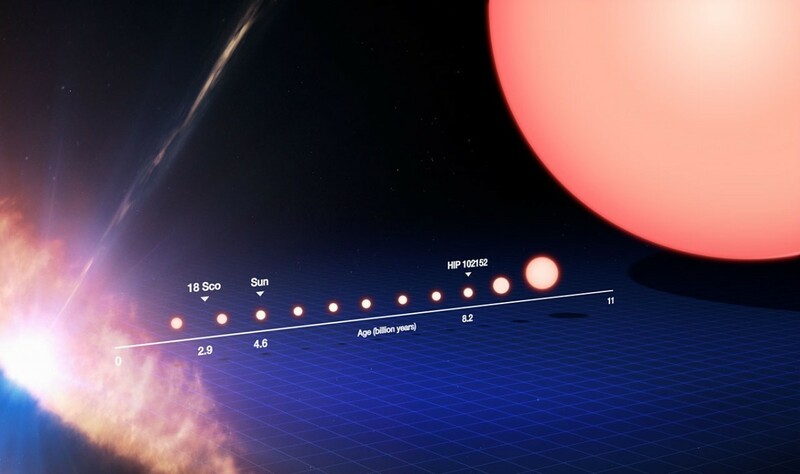 But this star is on the edge of entering its red giant stage, so we know its about 4 billion years older than our Sun. As such it gives us a glimpse of our Sun’s possible future, in much the same way that a 30-something person could look at a 60-something person of similar appearance. This is why solar twins are useful. They allow us test our understanding of the evolution of our Sun. One aspect this particular paper focused on was the level of lithium in the star. Lithium (the third lightest element) existed in trace amounts in the early universe, so you would generally expect that stars would have a similar level. But some stars, such as our Sun, have much less lithium than expected. We know that lithium is consumed in the cores of stars as other, heavier elements are formed (a process known as lithium burning). HIP 102152 has significantly less lithium present in its atmosphere than even our Sun. This, combined with observations of other solar twins seems to indicate a correlation between the amount of atmospheric lithium in a sun-like star and its age. If this correlation holds up, then it would provide a useful tool in determining the age of stars. Main sequence stars can be difficult to age because they are very stable. It is similar to trying to determine the age of someone between 30 and 50. By observing atmospheric lithium, we can better gauge where a sun-like star is in its life cycle.